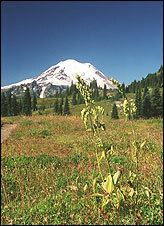 Some hikers consider early fall the best time to hike the trails of Mount Rainier National Park. It is true that you miss the best floral displays, but you also miss the crowds. On September weekends, if you get an early start you can find parking -- often impossible in July or August. However, the lack of crowds is only one attraction. There are many others, including close-up views of The Mountain as it makes its transition from summer to fall. Intense colors are beginning to appear -- not only the red foliage of huckleberry shrubs but also the brilliant, gleaming slopes of Mount Rainier set against the sharp blue sky. Mount Rainier sparkles on a late-summer day as seen from the Naches Peak Loop near Chinook Pass. You don't have to be an artist or a photographer to appreciate the changes in lighting, color and mood. On a warm afternoon it is a luxury to dawdle on a trail like the Naches Peak Loop at Chinook Pass. The trail gains only 700 feet in elevation and it is a hike that novices will enjoy as well as seasoned hikers. The hike begins on the Pacific Crest Trail No. 2000 as it heads south from Chinook Pass in the national park. From the parking area at the pass, turn left onto the PCT (Yakima Peak will be on your right) and cross state Route 410 on the wooden overpass. Naches Peak is seen from several vantage points. Depending on where you are, the peak looks broad and gentle, or steep and dangerous. Naches Peak may look like a walk-up but it's tougher than that, and on a Mountaineers Club scramble we thought it was one of the more harrowing peaks we had climbed. Soon the trail leaves the park and enters the William O. Douglas Wilderness. At one mile the trail comes to an unnamed lake, by far the prettiest section of the trail, with meadows and Naches Peak rising above. At about two miles, Dewey Lakes can be seen below, and in the distance, the Goat Rocks. Shortly after the lakes come into view, the PCT comes to the Dewey Lakes Trail junction (left) and descends to the lakes. The Naches Peak Loop continues right. The trail re-enters Mount Rainier National Park, and Mount Rainier comes into view. Soon the trail comes to another unnamed lake and, if there is no breeze, Rainier casts a reflection in the lake. The terrain begins to change -- the meadows mostly disappear and the trail is lined with mountain ash and stands of subalpine fir. The berries of mountain ash are an intense orange-red and in September the foliage is turning yellow. Very few flowers are blooming in mid-September other than Pearly Everlasting. Indian paintbrush, lupine, harebells and monkey flowers are making valiant stands against the coming winter. Soon Mount Adams comes into view and to the west, the dark, jagged crest of Governor's Ridge punctuates the base of Rainier. The trail comes out at upper Tipsoo Lake on Route 410 where a trail sign indicates the Naches Peak Loop (now about a half-mile from the start of the loop at the PCT trailhead). From here you can follow Route 410 back to Chinook Pass, but it is more pleasant to cross the highway and hike the trail back to your starting point. Cross the highway and follow around the shore of upper Tipsoo Lake in either direction to an unsigned trail junction near Route 410 and a picnic area. Turn right at this junction and follow the trail as it climbs in a short distance to the wooden overpass and the beginning of the loop. Oddly, this end of the loop is not signed and there is no mention of the Naches Peak Loop in the parking lot. There are enough hikers on the trail, however, that it would be difficult to go the wrong way. We do advise hiking the loop clockwise, since Mount Rainier is best seen this way. You also can create a shorter loop (3.4 miles round trip) by beginning at the Tipsoo Lake trailhead, a bit below the pass. Getting there: Go south on Interstate 5 and take the state Route 18/Auburn exit (before Tacoma). Follow the signs to Auburn and state Route 164 (take the second Auburn exit off Highway 18, not the C Street exit). Follow 164 through Enumclaw to state Route 410 and turn left. Continue east to Chinook Pass, about 44 miles from Enumclaw. At Chinook Pass, continue a short distance past the wooden overpass to a parking area on the left side of Route 410 (the Mather Memorial Parkway). This is the parking area for the PCT with stock access and portable toilets, elevation 5,040 feet. If you are beginning from Tipsoo Lake, park at the Tipsoo Lake picnic area lot and look for the signed Naches Peak Loop trailhead opposite the lake.